way to learn the basics of all good drawing. Welcome to Drawing Essentials Level 1: Foundation. In this section we'll be drawing pencil sketches to master the all-important basics of good drawing. I designed these lessons assuming you know absolutely nothing about drawing, (I even show you how to hold a pencil). But even if you have some drawing ability it would be well worth your time to go through these lessons anyway. It never hurts to get a refresher of the basics, you might even learn something new. How to hold and manipulate your pencil so you can draw beautiful lines and shapes. How to develop your Artist’s Eye and see your subject in a completely new way. 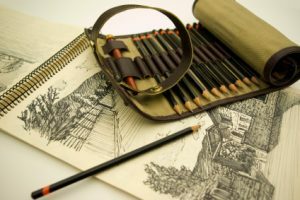 In order to draw great we have to be competent with our sketching pencil. We have to learn how to make the pencil do what we want it to do. So it makes sense that the first lessons are all about gaining control and dexterity with our pencils. We will do some pencil sketches of lines and the simple shapes that make up every subject we'll ever draw. We'll also learn a number of easy abstract drawing exercises you can do before your daily drawing practice. These lessons are all about developing your Artist’s Eye, which is a way of seeing things differently. (This is like a magic key for learning how to draw). We will do some pencil sketches that will trick our brain to see big shapes instead of objects like chairs, trees, dogs, etc. If we can learn to see our subjects as shapes and not objects it is much easier to draw them accurately. It might sound weird now but soon it will all make sense, and you will be amazed at how much this will help your drawing. Are you ready for your drawing adventure to begin? Great! I recommend going through the lessons in order. Take your time and most importantly, have fun.